In order to fix your heel pain, you need to align the bones of the foot into their natural position. You need to make them spread. Wearing shoes your whole life has caused them to be squeezed too close to each other. This position is what causes bunions, plantar fasciitis and other issues. The way you fix this problem is with toe spreading splints. These are the first toe spreading device you should try. These socks will put a small amount of stretch on your toes. You can wear these anytime of day, especially at night. Yoga toes are the most popular foot separator. They do a fabulous job with spreading the toes, but they are only useful for standing or sitting around at home. You cannot wear them in your shoes. These are cheap and give good results. They work as well as yoga toes but for much cheaper. Some people have reported these ones breaking over time. Yoga toes are made of higher quality silicone. I have not had problems with mine though, and they still work to this day. So this is up to you. Lots of reviews to read on this. Step Three. Dynamic Toe Stretching Devices. 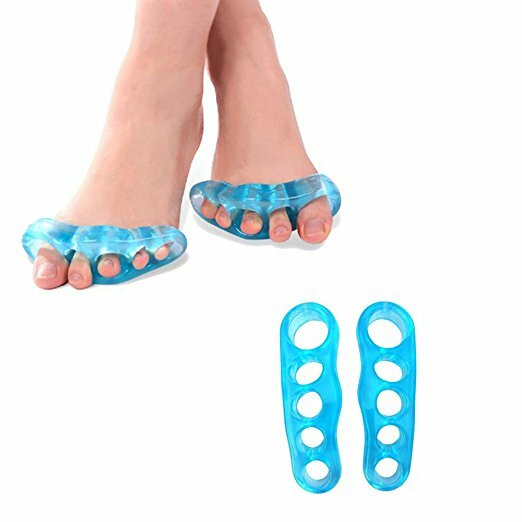 You need to find shoes that are wide enough to accommodate for these toe spreaders. You also need to make a slow transition to wearing these devices. I talked highly of these in my youtube videos, but I am not a big fan anymore. I have received emails from people saying that they caused pain from stretching their toes too quickly. They are also extremely expensive. Some doctors have questioned how safe it is to wear toes spreading devices while walking. The big toe spreader to the right is much safer to use while walking. I would also stick to wearing toe spreaders while standing, not walking. Works well for bunions. If you have a severe bunion, these should help. And here is a little tutorial that goes over some of these toe spreading devices. Also has some bonus exercises to strengthen the arch of the foot!